The Center for Prevention and Training is a workforce development initiative that strives to assist prevention professionals in their efforts to plan, implement, and evaluate science-based programming around the prevention of substance abuse, violence, and other high-risk behaviors. 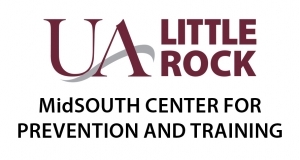 The Center for Prevention and Training resources include training, technical assistance, and a resource library housed on the UALR campus. The Center for Prevention and Training provides training on a variety of prevention topics reflecting the most current, science-based approaches to prevention. Copyright © MidSOUTH 2019, All Rights Reserved.